During the first decade of Israel’s existence, the state was forced to act for the most part within those same dependency frameworks pertaining to oil supply which had been in effect during the Mandate period. Foreign oil companies and governments dictated reality in this sphere to a large extent. Israel’s freedom of action to change this state of affairs unilaterally and swiftly was greatly constrained by its weak legal, political and financial position vis à vis these players, and by the Arab-Israeli conflict. Moreover, strategic considerations dictated a policy of cooperation with the major oil companies. Israel thus represents an exception in the history of the post-Second World War Middle East, where for many nationalists the oil industry proved an ideal weapon, either to demonstrate their anti-Western ideology by demands for nationalization, or to undermine the legitimate regime by the disruption of the oil industry and hence the national economy. 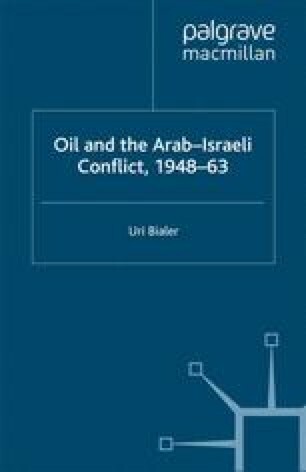 Still, as the history of Israel’s oil diplomacy during the first decade of independence reveals, it manoeuvred adeptly in this less than friendly arena and took several opportunities to promote its strategic interests. Thus, while cleverly refraining from embarking on an overt collision course with Britain and the oil companies, the state successfully employed threats to nationalize the Haifa refinery on two critical occasions in order to extract important strategic concessions.